After a busy schooling year, we are enjoying the vacation, but still spend 1 hour daily with the band activity. Here is some of the action happening this summer. But we got stuck with the recording process. No good recording equipment, no mixing tools, no experience, not enough time. These are great songs, we like them and we think they are definitely original. No catchy tunes, no hypnotic dancing rhythms, no extreme power – but still there is a lot of substance in each of the ten songs. The problem is we don’t like how they sound on record. There is a lot which is lost or changed, or it sounds too muddy, or not loud enough, or the sounds are different… Really painful. Anyway, we keep working on this. Cannot release it the way it is right now, but one of these days we’ll get it done somehow. Our first album is almost here. 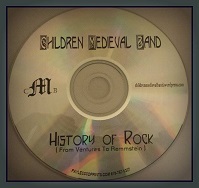 We have gathered some of our covers, which reflect the rock music timeline, on a cd, and got ready to release it. We had put a lot of work into this project, besides the previous effort of learning and recording these 14 songs, now we have spent time to re-record or re-mix some of them. Then we announced the release on facebook… But on the very last moment we found out that we actually need a license for doing this. Playing covers and distributing them cost money. In order to release this cd physically or on downloading sites, we would have to pay about $500, for the start. It doesn’t make sense, we don’t expect to sell anything. So that’s it, no more covers from now on. Sorry. The one hundred copies of this cd will stay in our storage as a reminder of a fruitless effort. Same as in San Diego. History of Rock show. Audience: about 200. “Across the Street” at Mueller College, San Diego, on Sept. 13th. That’s about it. Thanks for reading this post. Dear Cathlyn, sorry, but we’re busy now with three upcoming live shows. We expect to have the album done not earlier than the end of October or sometimes in November. Thank You!